SUBHEAD: The history of RIMPAC exercises tells us that this year will be more of the same. Destruction to life in the Pacific Ocean. Image above: Oops! 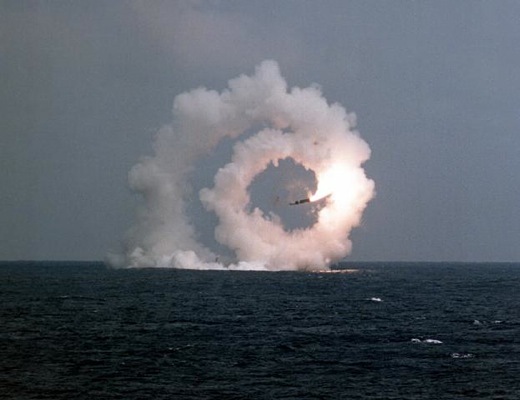 A submarine launched Trident missile goes off track during a test. From (http://www.fas.org/nuke/guide/usa/slbm/d-5.htm). As I have said before, it is my opinion that the US Navy is the single most destructive organization in the world. The ten nuclear powered aircraft carrier strike groups alone are capable of dominating all the oceans in the world. Each strike group includes Nimitz-class nuclear aircraft carrier, a Ticonderoga-class Cruiser, two Arleigh Burke-class destroyers, a Los Angeles-class nuclear attack submarine, and a last combat support ship. This does not count the nuclear powered Ohio-class submarines each carrying over a dozen nuclear warheads each tipped with multiple thermonuclear weapons. A mere 14 of these subs carry approximately fifty percent of the total US active inventory of strategic nuclear warheads. They prowl all the oceans and are alone capable of ending all life (but bacteria and viruses) on earth. The Trident missile are now carried on a number of other surface crafts as well. The Trident system was tested and perfected right here on Kauai at the PMRF. It's no misnomer. "PMRF" stands for the Pacific Missile Range Facility. Here in Hawaii we are at the eye of a nuclear powered storm. And RIMPAC is the spoon that stirs this poisonous brew. The RIMPAC 2014 motto is "Capable, Adaptive, Partners". The question is what are those capable partners adaptively engaged in and why. The USS Ronald Reagan nuclear aircraft carrier strike force is scheduled to lead in this year's exercise. The Reagan and other of its task force members were contaminated with radiation during the meltdown and explosions of atomic reactors at Fukushima Daiichi in 2011. The USS Reagan was so severely damaged that it was in drydock for a year and a half afterwards for decontamination. After RIMPAC it is scheduled to be permanently stationed in Japan. There is spewing uncounted tons of depleted uranium (DU) munitions into the ocean as "live" fire. Virtually all calibers of navel guns fire depleted uranium shells. Given the increasing radiation pollution due to the oceanside meltdown of multiple nuclear reactors and the continuing increase of radioactivity in Pacific Ocean due to hundreds of tons of radioactive cesium and strontium do we really need to add tons of DU into the ocean as well? For every exercise like RIMPAC the Navy seeks to get approval for a number of "takes" (or "killings") of ocean creatures including whales, dolphins and seals. Each kind of explosive device that affects the ocean has a circle within which a acceptable number of takes of various species is allowed by the EPA, NOAA and other agencies. The Navy's responsibility is to make observations before a live fire event or scheduled explosion and be sure that "only" an agreed upon number of sea life is destroyed. Is this the kind of Navy we need to "protect" us? Such practice with heavy assault equipment can be destructive to reefs, beaches, and dune structures. Oahu has "hosted" several such landings. Kauai's Barking Sands was hit by such an attack in 2002 (see below). How appropriate that the USS Reagan, a nuclear ghost ship, should be leading this pack through the radioactive waters of the Pacific Ocean. We can look forward to tons of fuel burned, uncountable DU munition rounds fired, massive explosions and brain-shattering sonar waves to contend with. But let us not forget the past impacts of RIMPAC exercises on Kauai and Hawaii. I know this is a lot of material, but it does show a bit of the RIMPAC history in the last twelve years. Image above: A live-fire exercise during RIMPAC 2012 sank the ex-USS Niagara Falls in waters 15,480 feet deep, 63 miles southwest of Kauai using RGM-84, GBU-10, GBU-32 explosive missiles and and 30mm depleted uranium munition impacts. From (http://comthirdflt.wordpress.com/2012/07/16/sinkex/). Off the coast of Hawaii in the next few months, three old US navy ships will go down in a blaze of glory. As part of the navy's biennial Pacific training exercise, called RIMPAC, warships, planes and submarines from 22 nations will use the vessels for target practice. Environmental activists are up in arms. 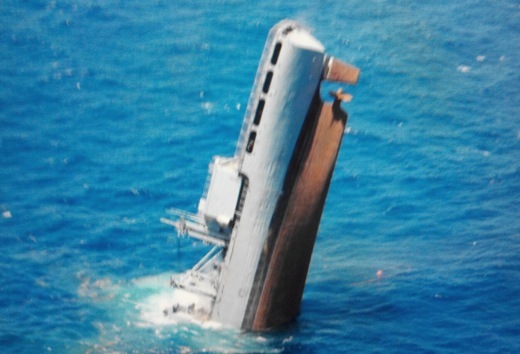 The navy has sunk 109 ships in "Sinkex" training exercises in US waters over the past 12 years. Activists say that each potentially contains in its structure hundreds of kilograms of polychlorinated biphenyl compounds (PCBs) - which accumulate in sea animals and may be neurotoxic - as well as asbestos and heavy metals. They cite military experts who say there are viable alternatives, such as using inflatable targets or simulations. So how big are the eco-impacts of Sinkex? Hard to say. This year's targets were built before PCBs were banned and before shipbuilders were made to report the toxic chemicals they use. The navy and US Environmental Protection Agency (EPA) reckons each ship contains about 50 kilograms of PCBs. That is based on similar ships and could be off by hundreds of kilograms, says Colby Self of the Basel Action Network in Seattle, which campaigns against the dumping of toxic chemicals. Rainer Lohmann at the University of Rhode Island did a rough calculation for New Scientist and estimated that PCB levels would only rise above normal ocean concentration within 1 kilometre of the ships and are unlikely to harm marine life even in that area. "It's not an ethical thing to do," Lohmann says, but he doubts that it is a big problem. Behind the activists' concerns lies a greater problem: it's easy to suspect that blowing up stuff harms the environment, but no one really knows by how much. More than any other industry, the military gets away with not declaring the impact of its activities on the environment, and dismissing the impacts that are known. Historically, the US military's reporting of training operations has been patchy - even activists admit the need for some secrecy - but there's reason to think the noncombat environmental impact is large. Military bases, where much of the training on US soil takes place, make up 10 per cent of the EPA's list of most contaminated sites. In a rare assessment of a training exercise, researchers found in 2010 that fish and sea mammals living near the USS Oriskany - an aircraft carrier sunk for training in 2006 - had raised levels of PCBs. The EPA considers any exposure to be toxic, and dumping PCBs, asbestos and heavy metals in US waters is illegal for everyone except the navy: Sinkex is exempted. Slowly, change may be afoot. This year the navy documented potential impacts of its Pacific exercises, including RIMPAC, in 1000 pages - the most extensive documentation so far. It describes, in very broad terms, a list of ocean pollutants, from PCBs and plastics to sonar noise and the by-products of weapons testing. No one else could get away with this contamination, says Self. "By saying 'This is for national security' they get the EPA to look the other way." Armed with the Oriskany results, three environmental groups filed a federal complaint against the EPA in December, aiming to end Sinkex's exemption. "The navy should play by the same rules as everyone else," says Todd True of Earthjustice in San Francisco, which represents the groups. The case is pending. Neither the navy nor the EPA had responded to requests for comment as New Scientist went to press. 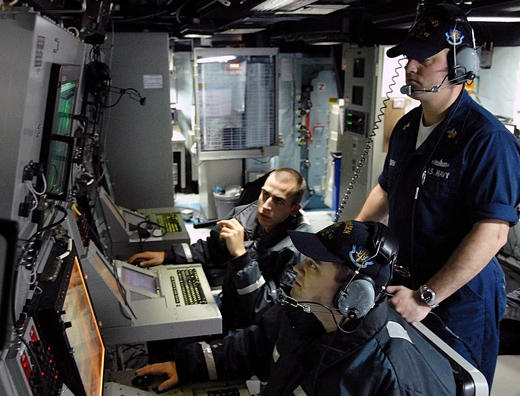 Image above: US Navy Sonar Technicians monitor contacts on an AN/SQQ-89V15 Surface Anti Submarine Combat System at sea. Photo by James R. Evans/U.S. Navy. From (http://www.kpbs.org/news/2012/may/14/thousands-marine-mammals-may-be-harmed-navy-sonar-/). The largest international naval exercise in the world off the waters of Hawaii known as the 2010 Rim of the Pacific or RIMPAC exercise involved 14 nations including South Korea, Thailand, Colombia, Peru and Malaysia with a total of 32 ships, five submarines, more than 170 aircraft and 20,000 personnel. One of the primary threats the month-long series of exercises were designed to address comes from quiet diesel-engine submarines, which national security experts say North Korea, Iran and other potential adversarial nations possess. The best way to detect something as quiet as a submarine running nearly entirely on battery power – as opposed to a noisy nuclear sub – is with high-intensity active sonar, which sends out pulses of mid-frequency sound as loud as a rocket blast underwater. The general consensus, with which courts over the past decade have largely agreed, says high-intensity mid-frequency sonar can kill whales and dolphins. The National Marine Fisheries Services – part of the National Oceanic and Atmosphere Administration – explicitly allows Navy sonar tests and training exercises to result in the deaths of specific numbers of whales and dolphins as long as they have a negligible impact to the population. Similar authorizations exist for training grounds bordering the entire west, east and gulf coasts of America including the Mariana Islands and Alaska, several of which the Navy is in the process of expanding. High-intensity sonar appears to cause bleeding from the head in some whales found stranded. It can also cause confusion and mass stranding into shallow bays. For whales that dive deep for food, biologists believe sonar may cause them to repeatedly dive, creating a severe case of decompression sickness that leads to death. RIMPAC concluded August 1 without a controversial whale stranding, unlike the last RIMPAC in 2008. That doesn’t mean, however, there were no marine mammals harmed or killed by the sonar used by the U.S. and other navies, says Marsha Green, PhD, founder of the Ocean Mammal Institute and one of the first to challenge the U.S. Navy on its sonar use in the mid-1990s. It’s been 10 years since the Navy last admitted in the Bahamas that sonar caused a whale stranding, while environmental groups point to at least seven strandings in U.S. waters since then and others worldwide. Despite the Navy spending $20 million each year – reportedly half of all marine mammal research globally – through the Office of Naval Research, much of the science about how sonar affects whales is still widely debated. Sonar comes primarily from ships at mid-frequencies up to 235 decibels or from helicopters that can strafe an area with sonar from above. The Navy is also looking into expanding its use of low-frequency sonar sometimes referred to as Continuous Active Sonar that can cover greater distances and may have a lower impact on marine mammals. But Green and others who’ve pushed the Navy to address the links between sonar and whale strandings still aren’t buying it. “This indicates that much of the bias in military-funded literature was in work carried out at military institutions, rather than in studies funded by the military but carried out at universities and other institutions,” according to the paper. The Office of Naval Research was proud to announce in November 2009 that a Navy-funded study by a team at San Diego State University and UC San Diego suggested whales might have more difficulty hearing sonar than scientists thought. “The study suggests mid-frequency active sonar sounds are largely filtered, or ‘muffled,’ before reaching the animal’s ears. The findings also suggest that higher frequencies used by whales to hunt prey are heard at amplified levels without any dampening,” according to an ONR press release. Mark Matsunaga, Navy environmental public affairs officer for the U.S. Pacific Fleet in Hawaii, stressed that two dozen marine mammals strand on beaches in Hawaii each year and that there’s still much about the ocean and whale behavior that scientists don’t fully understand. For many biologists, the science is clear at least in the most extreme scenarios. In Cuvier’s beaked whales that dive deep for food, high-intensity sonar can possibly cause them to dive repeatedly or drive them away from feeding areas. For other species, sonar generally confuses marine mammals that depend on sound to communicate and search for food. It can disrupt feeding habits and even put up a blanket of noise, driving them into shallow waters. 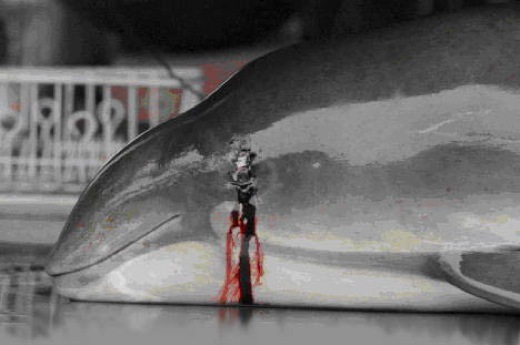 Affected species include Melon-headed whales, Bottlenose dolphins and Striped dolphins. NOAA requires a series of mitigation measures – many the result of lawsuits – that include powering down active sonar by specific decibels, depending on how far away animals are visible, to listening for them underwater with passive sonar and waiting until they are no longer heard for a certain number of minutes. However, the findings and requirements imposed by NOAA, like much of the science related to the effects of sonar on marine mammals, are subject to considerable debate. The decade-long effort by conservation groups to limit the Navy’s use of underwater sonar culminated in a November 2008 U.S. Supreme Court ruling. By a 6-3 decision, justices struck down increased mitigation steps imposed by the lower courts in California, saying they jeopardized national security. “The Navy has not at all been shy about talking about the national security importance of what they are doing,” says Paul Achitoff, attorney for Earthjustice in Hawaii who challenged the Navy over a series of training exercises in 2008 around the same time as the Supreme Court ruling. “Before our lawsuit, the Navy had a list of mitigation measures. It’s a long list but it all boils down to virtually nothing more than some sailors standing on deck with binoculars. As soon as the judge’s order in our case expired, they went back to doing what they had been doing before. Immediately following the lawsuit, which ended in January 2009, two whales and thousands of dead fish washed up on a beach in Kauai. Green says she filed a Freedom of Information Act request to find out what happened, but the Navy never responded, which is against the law. Navy officials are now taking part in ongoing talks with NOAA and the Natural Resources Defense Council on further mitigation, while at the same time the Navy is proposing to build a new training range in an area that infuriates environmentalists. Conservationists were shocked in 2009 to learn the Navy planned an Undersea Warfare Training Range outside Jacksonville, Florida about 30 miles from the only birthing grounds of the North Atlantic Right whale, of which there are only about 350 left. The federal government hadn’t acknowledged Navy sonar could, in fact, kill whales until attorneys with the NRDC and others sued the federal government more than 10 years ago. Attorneys argued successfully that the Navy had broken environmental law for decades without account. And while the documents produced by the Navy now run more than 1,000 pages each, environmental law attorneys often find them inadequate, says Michael Jasny, senior policy analyst for NRDC in British Columbia, Canada. Green and Achitoff don’t hold much hope for the current negotiations with NOAA, Navy and NRDC. Green participated in a similar three-year effort with the Navy and environmental groups that ended in 2006 with panel members quitting in disgust and the Navy accused of influencing scientists. “After three years, the Navy backed out,” Green says. “They sabotaged the whole thing. It was so underhanded it was unbelievable.” Green is also part of the Ocean Noise Coalition, which for the past eight years went to the UN Conference on Oceans and the Law of the Sea where, she says, ocean noise was a hot topic at its latest meeting in June. 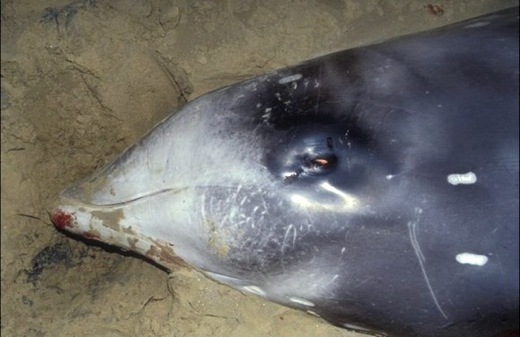 Image above: An example of a female Cuvier beaked whale that was stranded. These ocean mammals use a subdued sonar for hunting and navigation. From (http://wildiaries.com/articles/66). An environmental group is pointing a finger at sonar and the Navy's Rim of the Pacific exercises in the stranding and death of a 15-foot Cuvier's beaked whale Monday on Moloka'i, but the National Marine Fisheries Service said it doesn't yet know what caused the juvenile male animal to enter the shallow water. U.S. Pacific Fleet spokesman Mark Matsunaga, meanwhile, said it's "premature, speculative and irresponsible to link naval activities to this stranding." A veterinarian who examined the 2,500-pound deep-diving whale, which stranded itself at least twice, determined it was sick and would not recover, said Chris Yates, who heads the protected resources division of the National Oceanic and Atmospheric Administration's Fisheries Service here. Officials were made aware of the stranding at 8:30 a.m. Monday, and Yates said the decision was made to euthanize the whale at about 4:30 p.m.
"The animal was sick, would obviously have not lived being pushed out on its own, and would have suffered more," Yates said. A Molokai public works crew transported the whale to the airport, and the Coast Guard flew it in a C-130 aircraft to Honolulu. A necropsy still was being conducted yesterday at Hawai'i Pacific University. "Obviously, we want to do this as quick as we can," Yates said. "They could call me up and say, 'Oh, gosh, look what we found. This animal had some major problem.' " On the other hand, a cause of death may not be found, he said. The environmental law firm Earthjustice said the stranding came as the Navy conducted its multinational Rimpac exercise in Hawaii waters. Ten nations, 35 ships, including the aircraft carrier Kitty Hawk, six submarines, 150 aircraft and 20,000 military personnel participated in the month long Rimpac which had a heavy focus on sonar use for anti-submarine warfare training. "Deep-diving whales have come into the international spotlight as mass strandings around the world have regularly been linked to naval mid-frequency active sonar use," Earthjustice said. NOAA Fisheries determined that the use of midfrequency Navy sonar was a "plausible, if not likely" contributing factor to the mass stranding of up to 200 melon-headed whales in Hanalei Bay, Kaua'i, during Rimpac naval exercises in 2004. One contributor to the finding, Brandon Southall, later said the report did not conclude that Navy sonar caused the stranding. "We do not know what caused it," Southall said. Earthjustice and the Natural Resources Defense Council have sued the Navy multiple times over active sonar use. Yates said officials have no idea why the beaked whale stranded itself, but acknowledged that noise can be an issue for marine mammals. "They hear just like we do," he said. "But on the other side of that, we also want to make very clear that marine mammals strand all the time for various reasons, and it would really be unfortunate and premature to jump to conclusions about the cause of the stranding when we really don't have any idea." Yates said there are typically about two dozen strandings a year in Hawai'i. Monday's was the eighth whale or dolphin stranding of 2008. A past estimate placed the number of Cuvier's beaked whales around the Hawaiian Islands at more than 12,000. There had been five Cuvier's beaked whale strandings reported in Hawai'i before Monday, in 1950, 1970, 1981, 1996 and 1998, NOAA Fisheries said. The Navy said it conducted a 10-nautical mile search yesterday by air for other possible strandings, but none was seen. During Rimpac, NOAA Fisheries researchers tagged some marine mammals to see how they reacted to the naval maneuvers. Image above: Harbor porpoise killed by sonar of USS Shoup in Haro Straight 5 March 2003 and examined by NOAA Fisheries National Marine Mammal Laboratory at Sand Point, Seattle, WA. From (http://www.islandbreath.org/2006Year/15-peace/0615-12RIMPACimpact.html). Lawyers say the order, which temporarily bars use of the sound waves in an exercise off Hawaii, harms U.S. security. At issue is marine life safety. A judge's order banning active sonar during a naval exercise off Hawaii will damage national security, embarrass the United States in front of allies, and make it difficult to form future coalitions to "deter aggression," Navy lawyers charged in a federal appeal to lift the ban. District Judge Florence-Marie Cooper on Monday issued a temporary restraining order keeping the Navy from using active sonar in its Rim of the Pacific exercise until a July 18 hearing. Cooper also ordered the Navy to meet with Natural Resources Defense Council attorneys by July 12 to consider their lawsuit alleging that the sound waves would hurt whales and other marine mammals. The biennial Rim of the Pacific exercise, set to run through July 28, involves the naval forces of the U.S., Britain and six Pacific Rim nations, with 40 ships, six submarines, dozens of aircraft, and 19,000 military personnel. The active sonar portion of the exercise was set to begin this week. The Navy, backed by lawyers from the Justice Department, wants judges from the U.S. 9th Circuit Court of Appeals in San Francisco to quash Cooper's order. Waiting until a July 18 hearing would be too late in the exercise, the Navy says. The Navy insists that the use of midfrequency active sonar in the exercise is needed to help sailors learn how to hunt for quiet submarines similar to the kinds Iran, China and North Korea are using as the centerpieces of their naval forces. It contends that the mitigation measures agreed on during negotiations with the National Marine Fisheries Service are sufficient to safeguard the whales. But the Natural Resources Defense Council says in its lawsuit that the Navy should move its exercise farther from the Hawaiian Islands, expand the "quiet" zone where active sonar will not be used and add more spotters so that the sonar can be turned off if whales are discovered. Also, the council says the Navy manufactured "a purported emergency" by waiting until the exercise had begun to finish its environmental review and receive a permit from the fisheries service. The Navy's "tactics should not be rewarded," the group says. 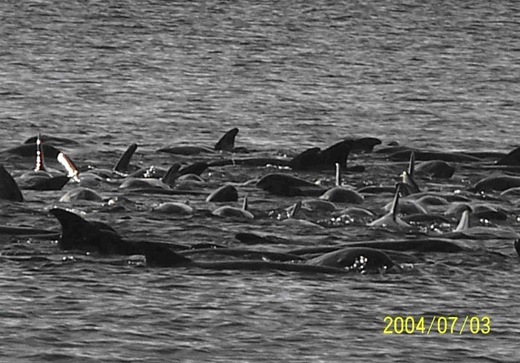 In 2004, during a similar multinational test of active sonar, 150 whales herded into a shallow bay. Federal scientists later concluded that the sonar was the reason for the abnormal behavior. In the court documents filed in the appeal, Rear Adm. John Jay Donnelly, deputy commander and chief of staff for the Pacific Fleet, says allowing the ban to remain in effect "from a foreign relations perspective would be an embarrassment to the United States and would seriously undermine our ability to build coalitions to address future threats in the Pacific Theater." After the Natural Resources Defense Council filed its lawsuit last week, the Department of Defense authorized a six-month exemption for the Navy from the Marine Mammal Protection Act. But Cooper ruled that the exemption did not cover another federal animal protection law, the National Environmental Policy Act -- an assertion that Department of Justice lawyers are contesting. Image above: RIMPAC sonar causes Melonhead whales to be stranded on Kauai in Hanalei Bay on July 3, 2004. They swam in circles until rescued. Photo by Gretchen Johnson. From (http://www.nmfs.noaa.gov/pr/health/mmume/event2004jul.htm). The Navy has acknowledged that sonar was used in the hours before a pod of deep-water whales swam into Hanalei Bay. New information calls into question the Navy's contention that the use of sonar during maneuvers off Kauai had nothing to do with driving a large pod of deep-water whales into Hanalei Bay during the Fourth of July weekend. Image above: U.S. Marines from Battalion Landing Team 2/3, Special Purpose Marine Air Ground Task Force Three, off load from Landing Craft Air Cushion (LCAC-47) as part of a beach assault exercise during the Rim of the Pacific (RIMPAC) 2002 multinational amphibious training exercise. On the morning of July 15, the beaches of the Pacific Missile Range Facility (PMRF) at Barking Sands were under assault. From original article. 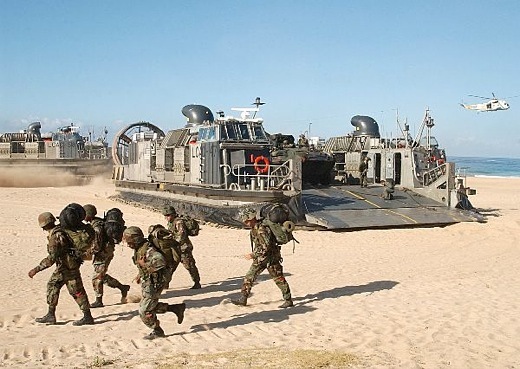 Invading forces hit the beaches in Marine Corps assault amphibian vehicles (AAVs) and Navy landing craft air cushioned (LCACs) - loaded with High Mobility Multipurpose Wheeled Vehicles (HMMWVs) and Light Armored Vehicles (LAVs). Luckily, the attack by friendly U.S. forces was the amphibious portion of the Rim of the Pacific (RIMPAC) 2002 exercise. RIMPAC 2002 is a multinational training evolution that includes military forces from the United Kingdom, Canada, Australia, Chile, the Republic of Korea, Peru, Japan and the United States. The training enhances the amphibious combat readiness of international and U.S. mainland and Hawaii-based military forces. The amphibious assault showcased elements of a capable Navy-Marine Corps team, specifically - the abilities of the Tarawa Amphibious Readiness Group (ARG) and the Marine Air Ground Task Force (MAGTF). The first Marines to hit the shore were transported in the AAVs - tracked landing vehicles that deployed from ships off the coast, plowed through the waves and surf, and drove up on the beach. The 28-ton, all-terrain vehicles are capable of carrying up to 21 fully armed combat-ready troops in water and over land. The next crafts to come ashore were the LCACs. These immense vessels are capable of high-speed over water, and over the beach transits with up to 60 tons of cargo. In this case, the LCACs were fully loaded with HMMWVs (or Humvees) and LAVs. The eight-wheeled LAVs, which have an amphibious capability all their own, are a formidable platform capable of reaching speeds in excess of 60 mph on land. Observers closely watching all the activities associated with the beach assault weren't all wearing uniforms. Capt. Don Wilson, the commanding officer of PMRF, invited a number of key community leaders to watch the amphibious assault, and to get a better idea of the vital role that PMRF plays in our nation's defense. Garden isle visitors included Hawaii State Senator Jonathan Chun; Hawaii State Representatives Bertha Kawakami, Ezra Kanoho, and Hermina Morita; Kauai County Councilmen Brian Baptiste and Gary Hoosier; Ron Sakoda, Sen. Inouye's Kauai representative; Rhoda Libre of the Kauai Watershed Council, Pam Parker of the Kauai Economic Development Board; Navy League President Dr. Jack Layton and his wife Bette; and Marine Corps League representatives Betty and Charles Kingsbury. Additionally, several key community leaders from Oahu traveled to Kauai to watch the exercise and tour PMRF. Guests from Oahu included Hawaii Supreme Court Chief Justice Ron Moon; State Senator Cal Kawamoto, Retired Maj. Gen. Alexis Lum - Senator Inouye's military liaison; Alan Furuno - military liaison for Congressman Neil Abercrombie; Dave Carey - President and CEO of Outrigger Hotels; Tom Smyth - State of Hawaii Dept. of Business, Economic Development and Tourism; and Carolyn Walsh - Medical Nurse Management, Arcadia Homes. When all of the sand and dust settled from the roar of the LCACs, there seemed to be a consensus of opinion that the invitation to observe this critical training operation was an honor, and the guests further agreed that the exercise was a critical element in training for this country's national defense. Bertha Kawakami, the West Kauai legislator for the State House of Representatives (14th District), said she was "thrilled to be watching an operation of this magnitude for the first time." Kawakami, a lifelong Westside resident and popular political leader who has served in the House of Representatives since 1987, commented on the fact that PMRF is an ideal location because of its isolation. "It is my hope to keep the (Barking Sands) area surrounding PMRF free from encroachment for these exercises and other tests, especially in these times of new warfare," Kawakami said. "Working in the legislature, I see how important this is in relationship to the this new era of terrorism, for both our protection locally and nationally, as well as for purposes of international safety." Hawaii State Representative Hermina Morita (12th District) admitted that she had no idea what to expect when she received the call to come visit PMRF for the RIMPAC exercises. "You always hear about PMRF but have no idea what these operations entail," said Morita. "It is clear that the base is important to national security. It looks so easy on television, but we just don't realize the amount of preparation and training that our troops must undergo to maintain freedom." Morita added that while she would like to endorse peace, this isn't always a reality. "We must do what needs to be done to defend our nation," she said. "The transition to technology (as an economic base for) Kauai also benefits civilians and brings professional jobs to the island." Morita's brother is a retired Air Force electronic warfare specialist, and her nephew is serving with the U.S. Marines. When the amphibious assault concluded, Capt. Wilson and members of his staff escorted the guests to the Range Operations Center for an overview briefing on the mission of the Pacific Missile Range Facility. At the conclusion of the briefing, the group was taken on a windshield tour of PMRF, and rounded out their visit with a lunch with the commanding officer. The guests also commented on the fact that they recognize the need for missile testing, improved technological capabilities in warfare, and the reality that having the defensive edge - all critical aspects of national security - have taken on greater meaning and urgency since the terrorist attacks of Sept. 11, 2001. These facts were not lost on Kauai County Councilman Gary Hoosier. "Being at PMRF today really makes me appreciate the degree of sophistication our armed services possess and the importance of training troops for readiness," Hoosier noted. As an elected official, Hoosier said that representing Kauai, where PMRF is a leading commercial employer and business enterprise that is critical to the nation's defense, gives him "a real sense of pride." "We live in a different world today," Hoosier said during an interview at Major's Bay where amphibious landing craft were storming the beach in the background. "In light of the world situation, and as an important part of our community, I'll do whatever I can to support the mission of PMRF." County councilman Brian Baptiste, agreed with Hoosier. "PMRF is an integral part of the community and it is very important to Kauai's West Side," said Baptiste. "As a main cog in (the wheel of) the Westside economy, there is no question of the value PMRF has to our community, our island, and our nation as a whole." Rhoda Libre, representing the Kauai Watershed Council, took the time to praise PMRF, and the base's new leadership. "PMRF is excellent in the technical realm, doing things like testing these unmanned aerial vehicles," Libre said, indicating that PMRF's role in this cutting edge technology is a major advancement toward peacekeeping efforts. "Homeland security needs community participation. Right now we are all walking on rice paper. We must be prepared for future acts of terrorism and copy cat scenarios." Libre also spoke positively about PMRF's new leadership under Commanding Officer (CO), Capt. Don Wilson. "It is apparent that with the new CO, we - the community and community representatives - can work together. PMRF's new leadership is listening to the people more than ever before. In the past local people felt that they weren't being heard, but the new CO is innovative in his strategy of working with the community," said Libre. Libre added that she was "very honored and privileged to have been invited to PMRF to observe the RIMPAC 2002 amphibious assault, tour the facility, and receive briefings from PMRF leadership. Capt. Wilson summed up his impressions of the day by saying, "it is always a privilege to have our bosses around for such an impressive event. Each and every American taxpayer is our boss, and the men and women in uniform don't take our responsibilities lightly. I'm glad we had the opportunity to showcase the capabilities of our Sailors and Marines during the amphibious assault, and then to highlight the tremendous capabilities of PMRF and all the wonderful people who work here." For more information about RIMPAC 2002, go to www.cpf.navy.mil/RIMPAC2002.